From left: Terrance K. Resnick, a partner in Resnick Associates; Chris Goebel, chairman of the board and CEO of Star Lumber & Supply Company; Dennis Stine, CEO of Stine Lumber Company; Jim Davis, President and CEO of Barrons Lumber. 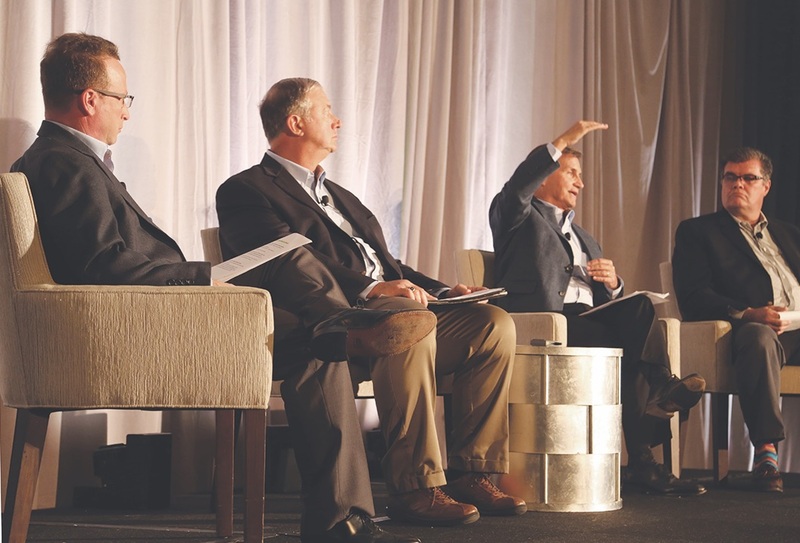 I served as a moderator at the LBM Strategies Conference 2018 held in Philadelphia in September, and I moderated a panel discussion focusing on a topic that is of the utmost importance for many lumber and building materials business owners: Succession planning. I had a tremendous panel including Dennis Stine, CEO of Stine Lumber Company; Chris Goebel, chairman of the board and CEO of Star Lumber & Supply Company; and Jim Davis, president and CEO of Barrons Lumber. Each of the panelists leads well-respected, successful companies and each provided valuable insight including specifics of the planning they have done. Ownership Succession and Management Succession plans in a macroeconomic context are the engines that keep businesses perpetuating. Most business owners think of succession primarily from an ownership perspective and yet while ownership succession is often the focus, many business owners in general are not actively addressing management succession. Management succession should be something that is proactively done as well. A business not only needs to keep the existing management team in place, but also in a best-case scenario make sure that the next generation of leaders and managers is properly groomed and remains with the company. One of the difficulties business owners often face is the question of how a business retains the managers to begin with. Sure, a nice salary and compensation package can be attractive, but it doesn’t necessarily create the motivation for talented employees to not look around to see if the grass is greener elsewhere. Non-qualified deferred compensation programs are often utilized as a way to retain and reward key employees by staying with the company until retirement. Essentially, it is a legal promise to the employee that if he or she stays with the organization until retirement, they will receive an additional and very attractive retirement compensation package. Active/Inactive Ownership is often a challenge for parents who own a business when not all members of the next generation is actively participating. Does it make sense to transfer the business to all the children regardless whether or not they participate? Traditionally, for most businesses, the answer has been “no.” There are many potential conflicts that may arise with inactive shareholders, however. Dennis Stine and Chris Goebel both provided personal examples of how their companies have allowed non-active owners and how they have made it work. The intention of this recap, unlike other articles I’ve written for LBM Journal that provide a lot of detailed information on a particular subject matter, is to further drive home the absolute importance of addressing your own business succession planning. If your intention is to successfully transition your company, you must proactively address this topic. Proactively addressing the topic means knowing with 100% certainty that the plan you have in place or will be putting in place meets all of your objectives from both a financial and personal perspective. Additionally, as discussed at the LBM Strategies Conference, it is critical to review and update your planning. My esteemed panelists have proven to be leaders in the LBM industry not only because of the successful companies they run, but because they realize the necessity of proper business succession planning for the long-term viability of their companies and employees, and most importantly, they have acted upon it. Sell your business now, or wait?